In 1909, the “Institute for Research of Fish and Fishing Conditions” under the name “Ichthyologic Section”, within the Institute for Applied Zoology in Zagreb, was founded. By establishing the Section a scientific research in freshwater fishing began. In 1920, the Section operated as the Institute for Applied Zoology in Zagreb, during the years the institution changed its name, organisation forms and the organisations it was part of, and in the end it became the “Research and Development Centre for Fishing, Zagreb”. From the day of establishment of the Ichthyologic Section until the establishment of the Institute for Freshwater Fishing, several scientists were engaged, including Professor Ervin Rossler and Professor Josip Plančić. With their work they provided the scientific basis for the development of scientific work in freshwater fishery. In 1923 the Institution founded the Testing station in Crna Mlaka which is the first station for practical research in fishing in this region. The institute, operating within self-management policy and self-financing, in the early fifties intensively cooperates with the fishing economy and solves its problems wherein it found subjective cooperation and financing sources. The most significant contribution was the implementation of new methods and fish breeding technologies and conducting test production (between 1950 and 1960). It was then proved that better culturing, better fertilization and feeding result in double or multiple productivity. Thanks to that, to non-refundable loan of organizations and the Croatian fishing economy, the Institute secured the funds and in 1961 became the owner of the Fish farm in Draganić near Karlovac. The fish farm was built in 1948 in order to meet the need for increased food production. The land was a marshland, flooded by the Blatnica canal. The canal was regulated and serves as an outlet-inlet canal of the fish pond. There were 100 ha of surface. 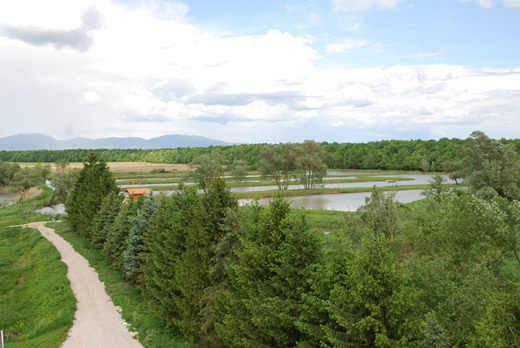 In 1958 the Fish farm Draganić was expanded for 24 ha, in 1962 for 100 ha, in 1964 20 small test ponds were finished, in 1968 it was expanded for another 142 ha. Working conditions were improving with the construction of the business premises in 1964/65. This allowed the purchase of equipment and staff expansion. When the Republic of Croatia became independent, in the 90s, the Fish farm went from state to private property. Sadly, this was also one of the typical cases of privatisation, and the Fish farm, due to bad management and unqualified staff, has been neglected and devastated for years, and subject to uncontrolled export. Soon after the bankruptcy, the Fish farm was taken over by a new (present owner). It was necessary to put things in order; first an inspection service was organized, followed by the production renewal. Four guards, workmen taking care of fish feeding, technologists of the fish farm have turned the Fish farm, from a devastated farm, to a modern fish farm, with yearly production capacity of 450, and even 500 tons of fish. The new owner changed the name of the fish farm to Fish farm Kupa.